Hey, in this post I am going to tell you some news worthy stuff (read it in the paper today y'all) and some personal stuff. What's the reason? Well because I got to the milestone of cumulatively 1,000,000 page views, on Sunday 1st June. Have a looksie over there, top right hand corner. But a couple of disclaimers. YES I KNOW it is based on "Blogger's" stats and YES I KNOW they are not accurate because they include bots trawling our blogs, or like whatever (I don't understand the techy stuff) but what I do know, is my stats have dropped by 1k a day because I barely blogged at all in April and May 2014. It's June now, time to turn that around yeah? Regular readers you still there? Wakey wakey come back. Pretty please! So today, I'm like in a soft play area, with NOTHING to do as Aaron is independently playing happily by himself (well without my input I mean) and rarely disturbing coming over to me, unless it's for drinks. He was so active in there he drank A LOT! Anyhow, I had NO book, NO magazine, NO laptop, so I rinsed my phone, but we all know, Smart Phones are not that smart. Yes they can survive a day on standby if you're not spending the whole day surfing Twitter and Facebook, i.e. talking to yourself, with the occasional response from a real life online human virtual being. Once the phone had lost the will to live and so had I, I did what I ought to have done in the first place and asked a member of staff if they had any reading material. They did, and it was ALL of the broadsheet kind. I'm a graduate, I'm down with that, except I was in more of a JK mood and felt like reading some trashy women's magazines. Ah well, straight away an article GRABBED ME. The secret was NOT in the headline. This was not The Sun I was reading, but rather yesterday's copy of the Sunday Times. A headline of "I'm ready for my close-up, Mr You Tube" does not really give much away, but the photo and its strap-line grabbed my attention. 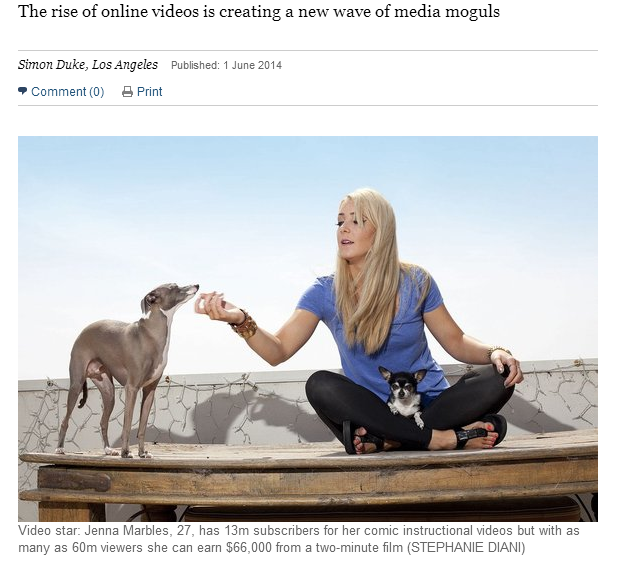 "Video star: Jenna Marbles, 27, has 13m subscribers for her comic instructional videos but with as many as 60m viewers [on one vid] she can earn $66,000 from a 2-minute film"
Got your attention now? Yep, it got mine too. Not for the reason that you think. It wasn't those dollar signs grabbing my attention. The last time I was materialistic, my age was probably in single figures. No, it's the STATS that grabbed me. I have been a wannabe You Tuber for quite some time and the ONLY reason my channel is not more established (or to rephrase that: doesn't contain more uploaded vids) is because the hubby dropped my Apple MacBook Xmas 2012 and it hasn't really been the same ever since, and I don't like editing videos without it, so it causes me not to upload them in the first place. I am not saying that had I continued I would have got to her dizzy height (far far far from it), but what I would have done, is vlogged more frequently, and hopefully by now I would have established my own voice, not necessarily with an audience, but I would have got into my own little groove. I have dabbled of late. I made a video for the Britmums Butterflies, (my bit starts at 3:10) but due to some editing (not mine I may add), you have no idea why I am flushed, so I might have to upload the unedited version one day LOL. I so enjoyed it, that that same day, I recorded another, My Friday Night with VERY FUNNY results, because Aaron unexpectedly hijacked it, and boy am I glad he did, as it is WAY better than what I could have ever done by myself! I hope it gives you an insight into us, what we look and sound like; how we roll! He's a cutie right? Anyway, back to the newspaper, so Jenna Marbles, I had never heard of her, but clearly after reading that today I have spent some time on her EXCELLENT channel. I recommend you do the same, but NOT if you want to go to bed anytime soon?!?!??! The video that the paper was referring to when it mentioned 60m views was this one below. HILARIOUS! You'll probably notice what I did that it's had 57m views, so the Sunday Times clearly rounded up, unless there's another big hitter there I've not found yet. but it would seem you have to "subscribe" to read the full article. How apt! It's getting late, so if I am going to do you a FULL SUMMARY of the article, I think I may have to finish this post tomorrow, along with a bit more about me and my million page views. I wasn't even online when it happened, at some point on 1st June. Love that date though! I do want to share a screen shot with you though, when I finish this post, to show you that although I started this blog in 2009 most of that traffic has come since 2012. When you dedicate yourself to something, as I did more so after redundancy, it grows. Like we were taught in Kundalini Yoga: "where your attention goes, your energy flows"! Anyhow another heavy weight the article mentions, again someone I had never heard of, is "Swedish hipster Felix Arvid Ulf Kjellberg" and apparently HE is the "undisputed King of YouTube" according to the Sunday Times. Clearly I need to get to know the You Tube scene a whole lot more........AND I need to spend more time on it (my to-do list if ONLY a mile long, I have time in my life for this....... like NOT)! So here's his channel which is actually called PewDiePie - he has 27 MILLION SUBSCRIBERS! He says on his channel: "I'm just a guy from Sweden who likes to laugh and make other people laugh. Sharing gaming moments on YouTube with my bros!" So, if you spend as much time on You Tube as I SHOULD do, please tell me in the comments, who YOU LOVE? What those two heavy weights above seem to have in common is that they are both VERY funny and VERY likeable. I know I could try to be the latter, but the former is something I seem incapable of. All through my twenties I was hilarious. For example, if I went on lunch with the other Managers at Sainsbury's Homebase circa 1997, they would be HOWLING with laughter from start to finish. But being a stressed out shouty Mum seems to have killed the fun in me. Maybe I can rekindle my inner funny, but till then I think online fame and infamy will continue to escape me, which quite frankly is probably a good thing as I like a quiet life, well -ish! So back to the subject at hand, to answer the question of the blog title, yes, I think you need to be funny and likeable. Everyone is SO busy nowadays that they have to have a REASON to watch. It needs to either answer a question for them, i.e. review somewhere they want to go, or something they need to buy, OR it needs to be instructional OR it needs to form part of their down time. Do all four and I reckon you're quids in. Well tomorrow, when I am more compos mentis I will pad this post out, with everything I have read in what was a very interesting article indeed. I don't know if I am a Vlogging kind of girl, but getting an insight into it, and finding out about these STARS has been incredibly fascinating. I have found the whole blogging thing fascinating - I love seeing people's vlogs! That make up tutorial yoosted was hilarious! Don't think I have the guts to vlog though! YouTube amazes me, I've started my own channel to kind of bounce off my blog, that's the plan any way, I plan on doing a intro vlog today, as soon as my make up & hairs sorted, how vain I am!!! My kids watch PewDiePie all the time & his girlfriend amongst others & talk about them as though they're soap characters, I even know where this boy went away to recently!! Off to subscribe to you now! I should also point out that my little man asks to watch YouTube (we don't have live tv... we watch catch up, amazon prime instants and youtube through the xBox instead!) and has his own favourite channels at the grand old age of 2!